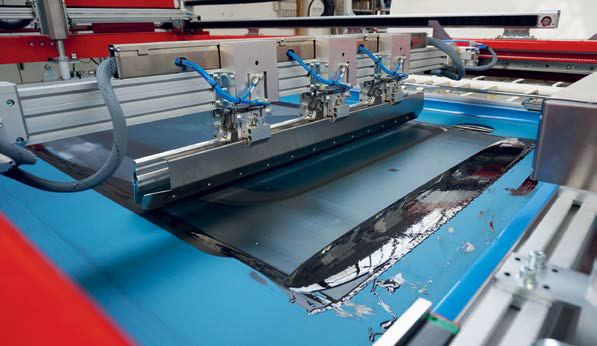 Including a strongly asymmetrical glass centering system, the DLE silk screen printing line from Cugher Glass srl permits set-up and changeover times of less than five minutes. According to Marino Bonetti, printing repeatability of less than 0.08mm is possible, together with short cycle times (from six to 15 seconds), automatic ink thickness control and zero clear border printing capability. The line features an anti-drip system, screen extraction without loss of registration and automatic peel off adjustment. 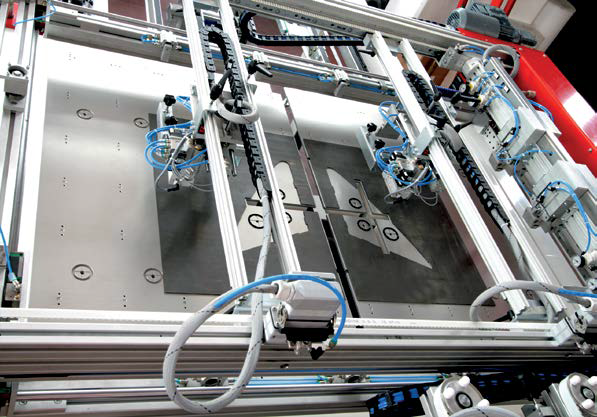 Founded in the late 1960s, Cugher was immediately among the first to automate the silk screen printing process. The company is now recognised as one of the most innovative and technologically advanced producers of silk screen printing machines and solutions worldwide. In particular, it is a leader in the automotive sector. Cugher specialises in the realisation of turnkey silk screen printing lines, providing a wide range of optional and complementary equipment and solutions, even for the most challenging production needs. Double and single glass minimum and maximum sizes for Series G DLE printers. Quality control of the silk screen printing process. Glass flow chart, showing glass alignment for Series G DLE printers. with centering undertaken away from the printing table. This solution helps customers to reach the maximum speed of the printing process for glasses with small and medium dimensions. The system consists of one crossshaped holder, with a vacuum cups system. The glass is collected by the walking beam while it is still in the centering device of the inlet conveyor; thanks to this operation, it is possible to transport the glass with great accuracy. No further glass registrations are necessary before the printing process. The G series special edition DLE (Double Lite Edition) for double glass printing has been engineered with the aim of maximum flexibility in a single printing line. 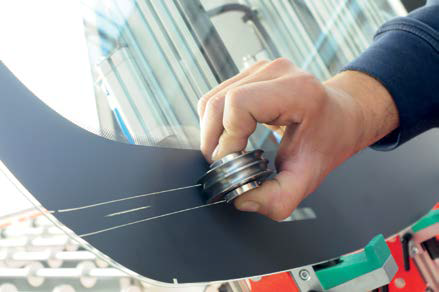 On one printing machine, it is possible to print two small glasses (sidelites or vents/ quarterlites) or one single big glass (eg backlite, windscreen or sunroof), allowing significant savings in terms of industrial space and cost optimisation, with a faster ROI. It comprises a alignment conveyor, an entry/centering conveyor, a printing body and an exit synchronised conveyor. The purpose of the pre-alignment conveyor is to perform the correct alignment of the two glasses before they are moved to the centering device. The equipment’s outstanding centering system features 18 axes, that allow users to centre all types of glass perfectly, even complex shaped pieces. 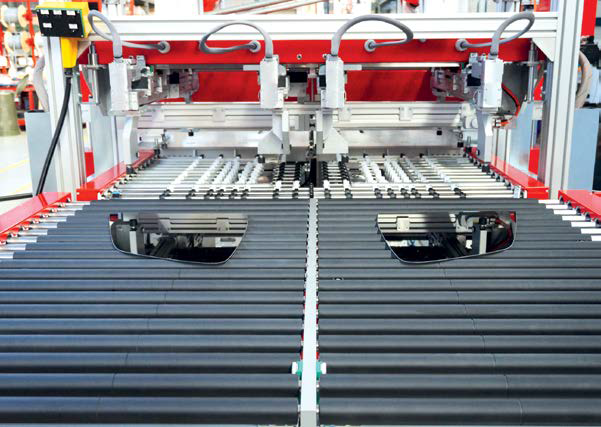 This automation allows a very fast set-up of the machine, even with two glasses. Glass shapes and sizes for Series G DLE printers. Easy to use and ergonomic, it is provided with a dimensional auto-learning function, controlled by the operator panel. To match the high flexibility of this machine with the high precision demanded by the industrial process, the transport system has also been specially engineered. 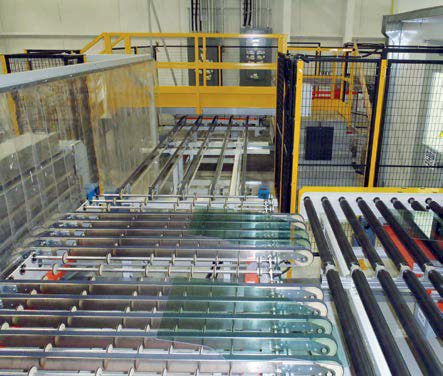 In instances where two glasses are to be processed, they are collected by two walking beams while still in the centering device of the inlet conveyor. Thanks to this operation, it is possible to transport the glasses with great accuracy. No further glass registrations are necessary before the printing process. And when processing a single glass, the two synchronised holders act as one big single holder (like a ‘spider’), transferring the centred glass from the centering system to the printing table. The whole DLE silk screen printing line has been designed to handle both single and double glasses, giving the opportunity to have an extremely flexible production and thereby reducing costs. The DLE is available to accommodate different glass sizes, from vents up to windscreens. Since the position of the pins will then be stored in a recipe system, the operator simply recalls the recipe and the pins will position themselves automatically. Detail of the printing process. Printing machine head with double logo print station.